So, I think I must be missing the point. 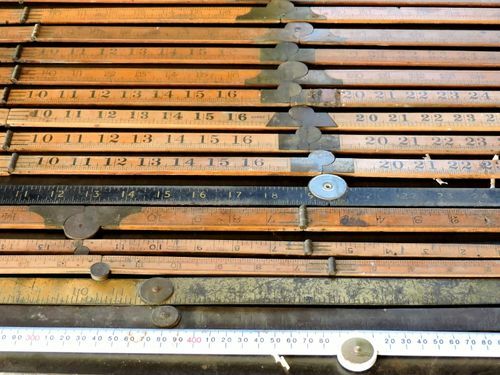 I have seen a number of youtube videos that include the use of one of those “old school” folding wooden rulers. 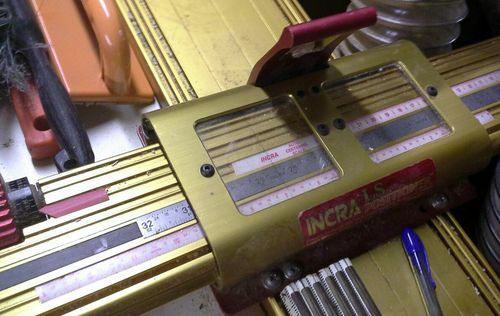 You know the kind…the kind your father (or grandpa) used to use all the time before tape measures stole the show. Can somebody explain it to me? I don’t see the allure. Why would one of these clunky (opinion) old things be anywhere other than a woodworking museum? For the same reason some people prefer hand tools to power tools; it’s the aesthetic enjoyment of using simple but well crafted tools instead of mass produced imported tools with no soul. (I use both antique hand tools and mass produced power tools, and a folding ruler and a tape measure… depending on the job at hand and my mood. Tape measures have a loose little metal thingy at the end that guarantee at least 1/16th of an inch of inaccuracy. Actually the loose end is supposed to make it more accurate… it moves according to whether you’re pushing it against a surface or hooking it over the edge, compensating for the tab’s thickness. The rule at the bottom of the pic is a current 1M Lufkin. I call it the blind man’s rule, very easy to read and I prefer it to steel rules. All the other rules pictured are all potential edgebanding for me. Jeff I’ve got an old Lufkin with a brass sliding insert for inside measurements. It’s a total game changer. I don’t know how I got along with out it. Give these old tools a try, they are wonderful and quite nostalgic. I hate tapes for fine woodwork, I stick a folding rule in my back pocket every morning, it is my go-to tool for measuring. As an old, retired, tradesman, who has used folding rules, I agree they belong in a museum…I guess I do also. I use my folding rule for case work only. The are great for getting inside measurements. However I will normally measure the folding rule with my trusted tape. Recently was installing built in shelving into a pantry. NOTHING was square. The opening varied a 1/4 ” back to front. My folder saw this and with my trusty tape was able to cut the shelving accurately. Folding rules are faster. Since the rule is six feet, you’ll hear dimensions like “six fourteen & three quarters” sounds cumbersome but realize the saw man has pre marked the six foot length on the stock already. All he has to do is measure 14-3/4” from his mark & cut. This is faster than measuring 86-3/4” as with a tape you have to pay it out & walk to measure instead of leaving the rule unfolded. These rules come with an inside measure that you can’t do accurately with a tape. I have Incra tools and DRO’s and still have the folding rule at hand. Nostalgia and romanticism Imo…nothing more. I like folding rules also.Tape measures always seem to be hiding when I need one.Plus it reminds me of work when I was under someone’s thumb. Since they are a bit slower to use it helps me slow down.less mistakes maybe. ignorance of folding rulers is alive and well, obviously. More accurate and consistent than tapes, they lay flat on the work (not curled). File a notch in the brass ends and it’s a panel guage. Or, don’t use it, doesn’t matter to me. But I will suggest a drop or two of machine oil on each joint improves the action considerably. All I ever hear about on this site is how wood moves, wouldn’t they fluctuate. I’m apparently ignorant because I don’t get the advantage over a well tuned tape measure. Oh well, each there own. Edit: Thought I would mention, I do have one hanging on my wall with my other antique tools. Boxwood has been used for rules for years because of its stability. I believe it was the primary wood used in drafting rules way back because of that. Masons still use a folding rule…...of course, their’s are marking a bit differently. Folder rules, can be used with just one hand, leaving the other free. Some even have a brass slider on the end, to use for that last inch or three in length, or as a depth gauge. Stanley make their first million dollars, making such rules. Now Lufkin makes the better ones.